Ok....I wasn't exactly playing with Martha Stewart....I was playing with my new Martha Stewart Deep Edge Border Punch - Lattice Hearts. 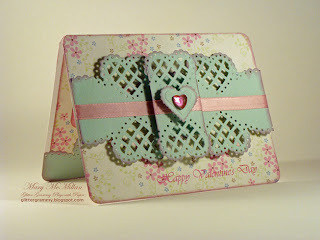 My card is a quarter fold and by layering, I was able to get 6 hearts on the front of the card. Without layering, I would have only had 4 hearts. The green card stock, the heart gem and the ribbon are all from my stash. The pink patterned card stock is from Imaginisce - Baby Powder - Oopsie Daisy. The sentiment is computer generated. I have a feeling my new punch is going to be used often. I must say the past few days did not leave much time for playing in my studio. Today, after my son went back to the city, I went into my play room and spent the day with my toys. I love playing with paper! Have a most wonderful week. Oh Mary! This is so pretty! I haven't seen that heart punch yet!!!! Gorgeous! Sandee, This punch loves card stock and doesn't do well on light weight paper. I folded the card stock and punched both sides at one time. I was amazed that the punch would go through so much.